P aul Emery Music and the Miners Foundry will present the San Francisco Mime Troupe in an outdoor twilight concert on Friday, August 26, 2016 at Pioneer Park. 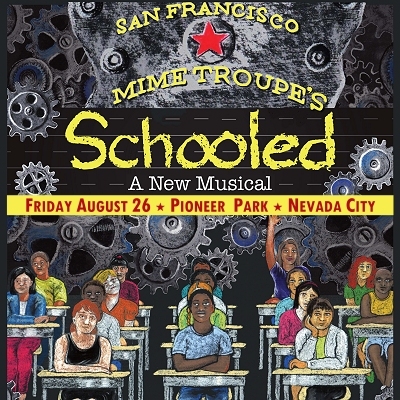 The San Francisco Mime Troupe will open their 57th Season with “Schooled”, written by Michael Gene Sullivan and Eugenie Chan with music and lyrics by Ira Marlowe. Gates open at 6:30 p.m., music begins at 7:00 p.m., and the show is at 7:30 p.m. Patrons are welcome to bring lawn chairs as well as outside food and nonalcoholic beverages to the show. No glass may be brought into Pioneer Park. No outside alcohol is allowed. Alcohol may be purchased at the bar. Coolers, picnic baskets, backpacks, and bags are subject to search. Tickets are $20 and are available online, by phone or in person at the Miners Foundry, or in person at Briar Patch Co-Op. Ticketing fees may apply. The San Francisco Mime Troupe creates and produces socially relevant theatre of the highest professional quality and performs it before the broadest possible audience. SFMT makes sense of the headlines by identifying the forces shaping our lives and dramatizing the operation of these giant forces in small, close-up stories that make audiences feel the impact of political events on personal life. Education. It’s like the weather. Everyone has an opinion but nobody does anything about it. That’s how Lavinia Jones feels about her son Thomas’ new school, Eleanor Roosevelt High. Decades of funding cuts have resulted in old textbooks, crumbling classrooms, and underpaid teachers, making Roosevelt exactly the sort of public school that has failed students time and time again. Isn’t it time for something … efficient? Efficient is exactly what Fredersen Babbit, from Learning Academy for Virtual Achievement (LAVA Corp.) promises to bring to the district. New technology, remote learning, computer-generated teachers, LAVA promises to put the “virtual” in achievement! But with kids learning from home, do we need all these empty schools? And with privatization on the line, a Wall Street heavy hitter on one side, and a feisty octogenarian teacher on the other, suddenly the next School Board election is more about a hidden agenda than the open curriculum. Are schools the last chance for democracy, or is education the next frontier for profit? Can we trust a politician’s public/private plan to replace an out-of-date system, or is there something even more sinister than privatization going on behind the doors of LAVA? And wait = when did the hall monitors start wearing brown shirts and arm bands? When it comes to the real plan for the future of education – and of our democracy – are we all about to get … Schooled?